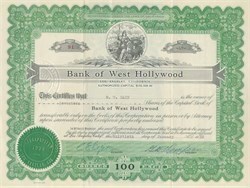 Beautifully engraved Certificate from the famous Bank of West Hollywood issued no later than 1930. This historic document has an ornate border around it with a vignette of a women holding a shield next to a bear. This item is hand signed by the company's president and secretary and is over 74 years old. This bank along with many others was a casulty of the stock market crash and depression.